"GData::Client::AuthorizationError: request error 401" or "GData::Client::AuthorizationError: request error 409"
This means that your Google Sheet submissions are getting stuck. First, you will need to redirect the failing submissions to your new Google Sheet Destination. 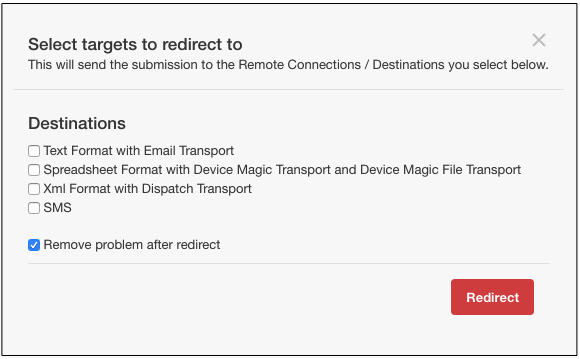 To do this, go to your Delivery Problems page (the link can be found on your Dashboard when you have submission errors) and click the "redirect" button that appears beneath each submission error. Once you click this, you will see a box appear that lists the available alternative Destinations you can choose from. You can also choose to remove the error from your Delivery Problems page once it has been directed. After you've redirected the errors to your new Google Sheet Destination, go to your "Forms" page and click on the form. Then click "Destinations". Once the "Destinations" page has loaded, click the "X" button on the far right of your Google Sheet Connection. You will need to delete the Google Sheet Destination in order to prevent further submission errors. Once this has been done, all future submissions will go to the new Google Sheet Destination. Note: If you have any questions regarding this or would like further assistance, please contact our support team.